This BLACK formal style dress shirt having deep V neck style with button placket and single pocket at front at bust level. Full length sleeves making the shirt simple but sophisticated in its own style. Might be matched with any below wearings. Color range is available in all standard sizes. This WHITE full sleeves striped casual shirt having buttons placket and cuff style with v neck short..
Jolly style multi-colored short sleeved is same from front and back. Its round neck style will give .. 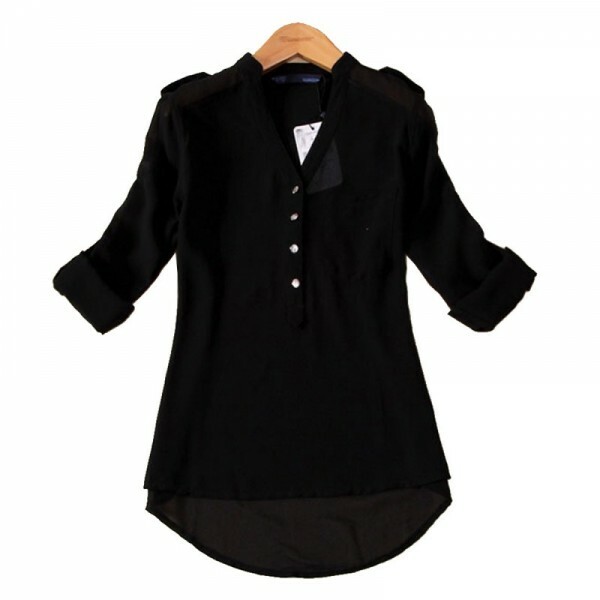 Very sophisticated designed this half sleeved and knee length cloth is attracting girls. Give a styl.. This PURPLE colored crossed style making v neck with short sleeves. Flowers are printed on overall s.. This elegant looking LIGHT BLUE short sleeved top is to show your style of sophistication. The desig..